WINCHESTER — Every photograph is rooted in the past. Click the shutter even on some super-slick digital camera, one that makes photography seem all but instantaneous, and the super-slickness doesn’t help. No matter how quickly you look to see the image just taken — even if you had split-second reflexes and the dexterity of a demigod — what you see is always the past preserved, never the present framed. The click demarcates then and now. The image bridges them. That’s obvious enough. To connect then with now is why people take pictures. Grammatically, a photograph manages the neat trick of being in the past tense while seeming to be in the eternal present. What makes David Prifti’s show “Drawn by Light” so arresting is how the images strive to eliminate any illusion of mixed tenses. They embrace pastness. They proclaim their past state, doing so either through a distressed corporeality or the elegant sneakiness of process substitution. The show is one of several at the Griffin Museum of Photography that run through March 2. Prifti, who died in 2011, taught at Concord-Carlisle High School for 25 years. By all accounts a passionate teacher, he was himself passionate about conveying photography’s relationship to time and memory. It’s in the nature of memories to crack, fray, fade, degrade. Prifti came up with a simple yet powerful way to express this. He’d take discarded objects (usually wood, sometimes metal) and use liquid photographic emulsion to transfer old photographs onto them. The resulting photographic assemblages look haunting — and feel haunted. They make memory into something sculptural. Some are big. Some are so small as to be mere fragments. They lend the pastness of the photographic image a literal solidity. With them, Prifti made of bric-a-brac something ineffable. The other photographs are more conventional. Starting in 2005, Prifti began making photographs with what’s known as the collodion wet-plate process. This was a standard photographic process in the mid-19th century. So these images, tintypes, convey a sense of temporal dislocation. He made them in the 21st century, yet they look and feel as though they were made 150 years before. Thus through technical means, pastness is underscored. As it happens, these images have a sleek, polished appearance at the furthest remove from the assemblages. Adams gathers rusted old cans — beer cans, paint cans, food cans — and places images on their lids or bases. 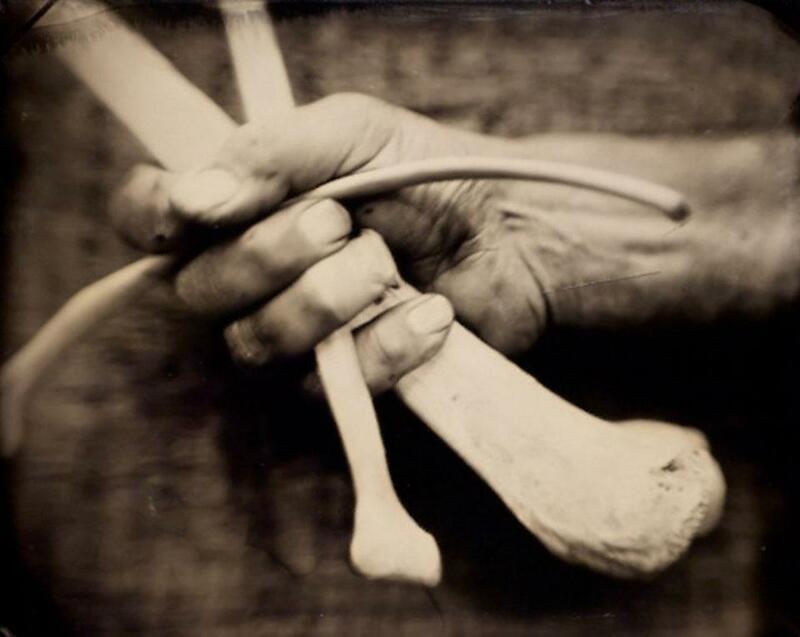 Like Prifti, he uses the collodion wet-plate process. While the results are visually striking, what’s most striking is the cans themselves — they’re like patinated cylindrical sculptures — rather than the photographs. The idea is for the cans to serve a secondary purpose, as a plinth does for a statue. Yet they dominate visually. For “Confluence,” Denyse Murphy also relies on an early photographic process: cyanotypes. The photographed object has a whitish appearance on a blue background. Murphy puts a thin covering of plastic over light-sensitized paper and photographs her own body and the bodies of family members. Murphy says she aims to create “constructs of identity.” The images are big, 22½ inches by 30 inches, and look not so much like renderings of identity as wayward anatomy lessons. Blue may or may not be the warmest color, but it’s definitely not the most expressive. 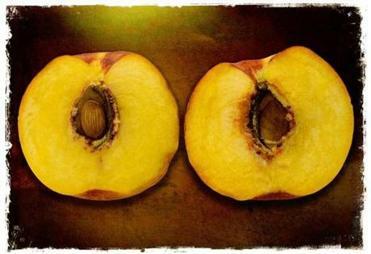 Barbara Ford Doyle derives her title, “Peaches and Penumbras,” from a phrase in Allen Ginsberg’s poem “A Supermarket in California”: “What peaches and what penumbras!” Ginsberg’s exclamation is implicit in Doyle’s eight large color diptychs. The split melons and avocados and peppers and pomegranates are so coolly luscious (chromatically luscious, too) that they are their own punctuational emphasis.